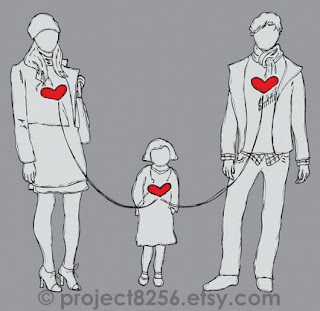 So I stumbled upon this awesome print on Etsy a few months ago that I fell in love with...it's about how regardless of DNA, love is what holds a family together. I contacted the artist and asked her is she would be able to do a custom print to represent my (soon-to-be) family and she said yes. I've been waiting and yesterday she got back to me with my custom print, which is now available to the public in her Etsy shop. Not only is she an amazing artist, but all of the profits from her artwork go towards her sisters adoption from Ethiopia. Me, Poppy and Marc. I literally started crying when I saw it. She is mailing it out to me today and I can't wait to get it! I love it! Where did you find this? It's perfect and soooo true! It reminds me of a comment my aunt said to me (when I told her of our upcoming adoption) last week, "There is much more to motherhood than just giving birth.."
Oh Amanda, this print is absolutely amazing. The ties that bind...how perfect. 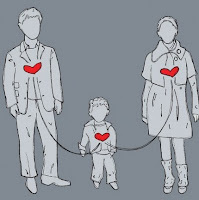 This shows your complete family. All of you TOGETHER for the FIRST TIME. I have to say, I teared up myself. I'm crying! It is absolutly beautiful! It is truly amazing how you can love someone you haven't every met (through adoption or pregnancy). The ties of love are a remarkable thing. That is SO cool...I want one too! Great find! I love Etsy! THAT PICTURE IS GORGEOUS!!! I totally teared up when I saw it. Poppy is so lucky and she doesn't even know it yet!!!!!!!!! !